Join our Renault Zoe preview in Paris | What Car? 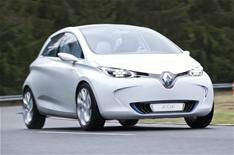 The Renault Zoe is no ordinary electric car. At heart its a conventional five-door supermini, but one that manages to combine its real-world appeal with funky, futuristic styling. What's so 'real world' about it? Well, it's affordable just 13,650 for the entry-level model and thanks to the under-slung battery, it has a proper boot. Renault has high hopes for the Zoe, but we want to know what you think. If you fancy being whisked off to Paris for the day on Wednesday, June 6 to see Renault's new Nissan Leaf rival, get in touch now. Contact us here: [readertestteam@haynet.com](mailto:readertestteam@haynet.com?subject=Zoe Reader Test Team). If youre selected, well also need you to send us your passport details.